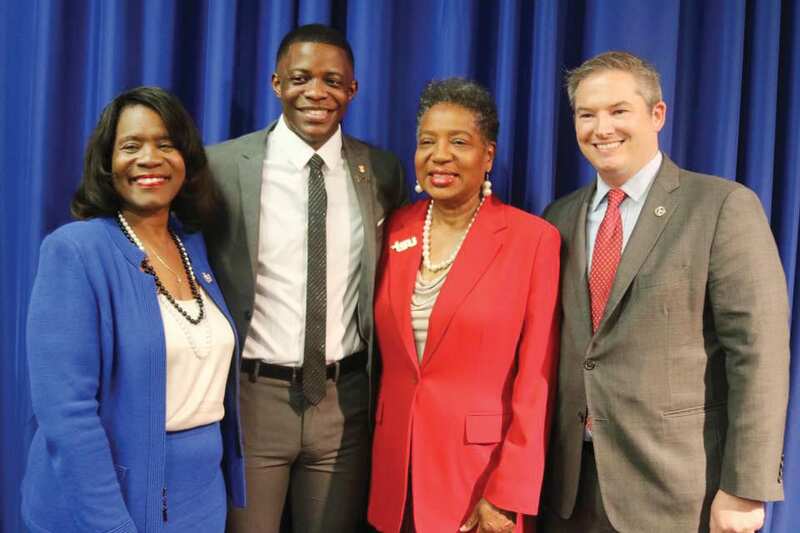 NASHVILLE, TN (TSU News Service) — Tennessee State University has set up a scholarship in the name of alumnus James Shaw, Jr., who has received national acclaim after disarming a Waffle House shooter last month. The announcement was made during a reception held in Shaw’s honor at the university Monday evening. TSU’s Farrell-Westbrook Building was filled to capacity as the Nashville community, state and local elected officials, as well as TSU students, faculty and staff joined the University for the Special Event. TSU President Glenda Glover welcomed the crowd and led a program consisting of area businesses and civic groups paying homage and giving awards to Shaw for his heroism. 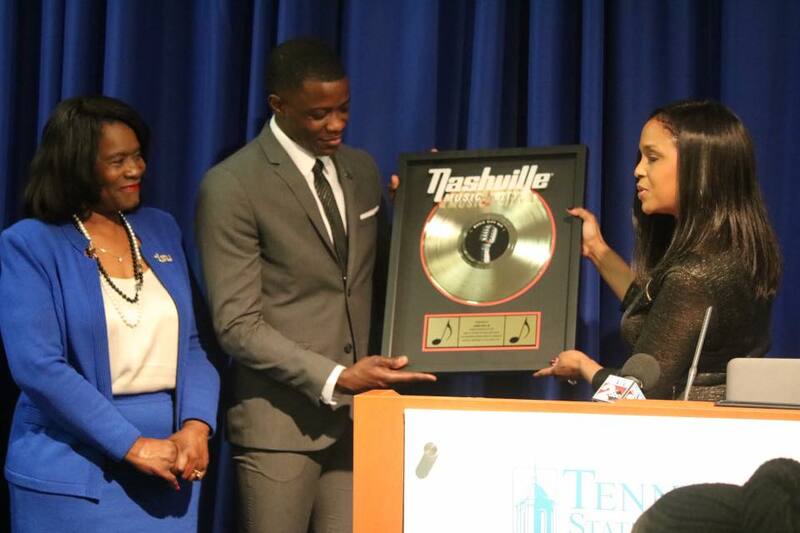 James Shaw, Jr., center, receives gift from Marie Sueing, right, vice president of Multi-Cultural Community Relations with the Nashville Convention and Visitors Corporation as Dr. Glenda Glover, TSU President, looks on. Presentations were made by Joni McReynolds, president of the TSU National Alumni Association; Marie Sueing, vice president of Multi-Cultural Community Relations with the Nashville Convention and Visitors Corporation; Carolyn Waller, president of the Nashville Black Chamber of Commerce; Attorney Mary H. Beard with the Nashville Napier-Looby Bar Association; and LaDonna Boyd, CEO of Boyd Publishing Company, along with Alpha Phi Alpha Fraternity, Inc., of which Shaw is a member. Shaw and his family beamed with pride following each recognition, and were equally surprised and moved about the scholarship in his name. Attending with him were his parents James, Sr. and Karen Shaw, grandmother Mary Louise Edwards, sisters Brina’ and Brittni, cousin Mari Ashley and four-year-old daughter Brooklyn, and her mother Jalicia Collins. 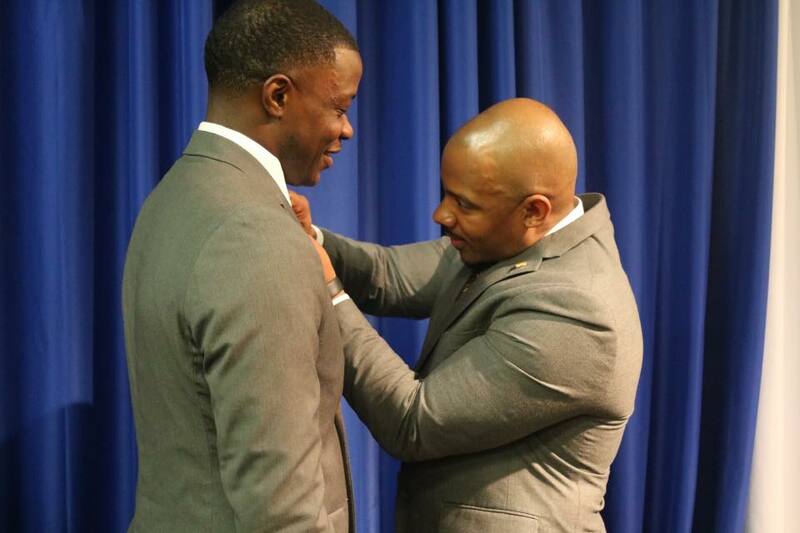 James Shaw, Jr. being pinned by Dr. Jamie Riley, a TSU alumnus and executive director of Alpha Phi Alpha Fraternity, Inc.
Nearly $15,000 was collected just moments after the university made the scholarship donation information public. This included $11,000 from his fraternity. Numerous members of Alpha Phi Alpha Fraternity, Inc. where on hand for the celebration of their fraternity brother. The fraternity’s Executive Director Dr. Jamie Riley, also a TSU alumnus and from the university’s Beta Omicron chapter as Shaw, made a special presentation. Dr. Riley lauded Shaw for his bravery and presented him with a lifetime membership. “Your example challenges me and others to be our best even in the most uncomfortable circumstances,” said Riley. Dr. Everett B. Ward, general president of Alpha Phi Alpha Fraternity, Inc., of which Shaw is also a member, shared a similar sentiment in a statement. 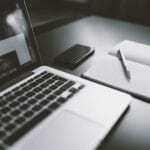 Four people were killed and several others wounded during the April 22 incident at a Waffle House in the Nashville suburb of Antioch. Authorities have said there would have probably been more casualties had it not been for Shaw’s actions. The 29-year-old wrested a rifle away from the gunman and tossed it over the counter before shoving the shooter out the door. Rep. Brenda Gilmore, a TSU alumnae, along with Sen. Jeff Yarbro shared special remarks at the event and applauded the Nashville native for springing into action. Shaw has been humble about his actions, saying he’s really not a hero. And he reiterated that on Monday. 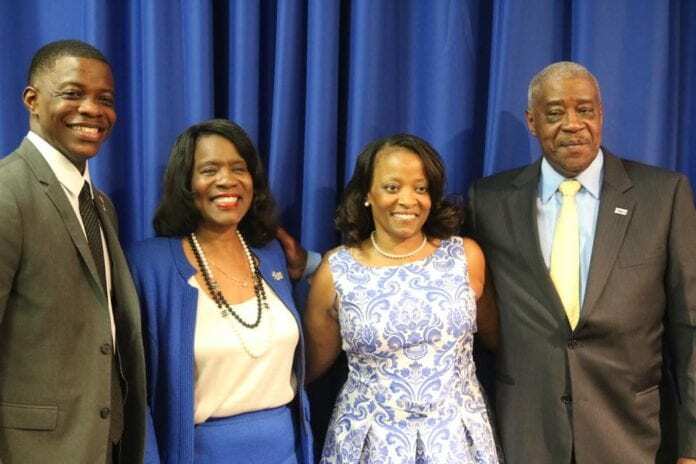 During the event, President Glenda Glover also announced that Shaw will receive a Special Presidential Recognition at Tennessee State’s homecoming in October.